We Happy Few, a drug-fueled alt-60s dystopian nightmare in which you take your happy pills or you get your face bashed in, was revealed earlier this year with a bizarre announcement trailer. Today the Kickstarter campaign got underway, and predictably, the pitch trailer is every bit as weird. In We Happy Few's version of history, England was successfully invaded and occupied by Germany during the Second World War, and most of the country has been reduced to rubble as a result. At some point during the occupation, the citizens of Wellington Wells had to do A Very Bad Thing—capitalization courtesy of developer Compulsion Games—and to deal with the guilt and anguish that followed, they invented Joy, a drug that makes them happy and lets them forget. And not taking it is not an option. We Happy Few is played from the first-person perspective, but the Kickstarter actually describes the game as a roguelike: It takes place in a procedurally generated world, and it will most likely kill you with some regularity. It's possible to stay out of trouble by following all the rules, but that will impinge upon your ability to explore, discover Wellington Wells' secrets, and ultimately escape. If you break the rules and get caught, which seems to be very likely, you'll be pulped by your fellow citizens. In times of crisis, you can pop a Joy pill to get pursuers off your back, but too much of that will lead to an overdose. And every time you die, the town is reinvented from the ground up, forcing you to start all over again. For a closer look at what's coming in The Happy Few, don't miss our interview with Creative Director Guillaume Provost, recorded in March at PAX East, and our hands-on experience with a pre-alpha build. 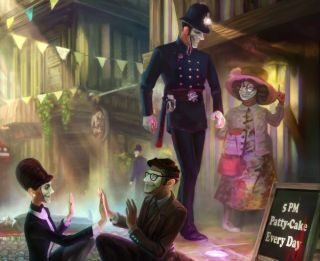 The We Happy Few Kickstarter, with a goal of $250,000, began today and runs until July 4.